Install the managed package in your Salesforce CRM org. Set up the Salesforce System User. 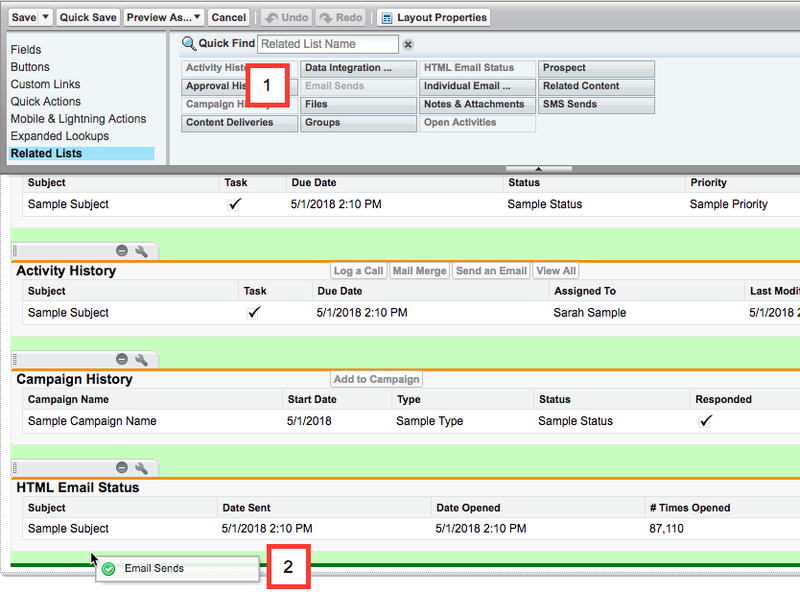 Complete the preliminary configuration steps in your Salesforce CRM org. The first part of the Marketing Cloud Connect installation and configuration process happens in the Salesforce CRM org. If you’re the Salesforce admin for this environment, check to confirm that you have Custom Platform Events enabled in your org. It must be enabled for the managed package to install successfully. Under Build in the Setup menu, click to expand the Develop menu. Scroll down to see if Platform Events is an option. If you’re missing this option, create a case with Salesforce Support to have them enable Custom Platform Events for your Salesforce org. Once you’ve verified that you’ve got Custom Platform Events enabled, find the latest version of the managed package and instructions for installing it in this article. Follow the “Install for Production Org” link in the article. Select Install for Admins Only, and be sure to wait until the managed package installation is complete before moving on to the next step. Once you’ve installed the managed package, you need to do a few initial configuration updates inside Salesforce CRM. If you normally work in Lightning Experience, switch to Salesforce Classic before you follow these steps. In the Salesforce CRM org, click Setup. Enter Users in the Quick Find box and select Users. Under Customize > Users, click Page Layouts. Under User Page Layouts, click Edit next to User Layout. Drag Marketing Cloud for AppExchange Admin (1) from the palette into the Additional Information section of the user page layout. Drag Marketing Cloud for AppExchange User (2) from the palette into the Additional Information section of the user page layout. Under Build in the Setup menu, click to expand the Customize menu. Click to expand the Leads menu. Identify a page layout to work with and click Edit next to the name. For now, it’s best to select a page layout that only admins can see, to avoid confusing other users. In the tool palette, select Related Lists. Drag Email Sends (1) from the palette to the bottom of the Lead page layout (2) to create a new related list. Drag Individual Email Results from the palette to the bottom of the Lead page layout to create another new related list. 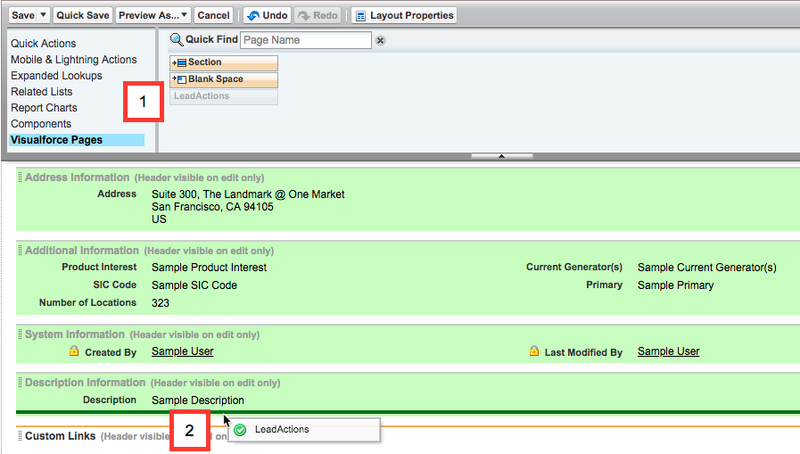 Click Visualforce Pages in the palette. Drag LeadActions (1) from the palette to the Description Information section of the Lead page (2). For Overwrite Users’ Related List Customizations? click Yes. When you’ve completed all configuration steps and are ready to deploy Marketing Cloud Connect to your users, repeat these steps for all of the Lead page layouts that are assigned to users who plan to use Marketing Cloud Connect. Click to expand the Contacts menu. Drag Email Sends from the palette to the bottom of the Lead page layout to create a new related list. Drag Individual Email Results from the palette to the bottom of the Lead page layout, following Email Sends, to create another new related list. Drag ContactActions from the palette to the Additional Information section of the Contact page. At least one user in the Salesforce CRM org needs full access to configure Marketing Cloud Connect inside the CRM environment. Once you’ve identified the right person (typically this is the overall Salesforce admin), follow these steps to assign the permissions to that user. Under Administer in the Setup menu, click to expand the Manage Users menu. Click Edit next to the name of the admin user you’ve identified. Under Additional Information, select Marketing Cloud for AppExchange Admin and Marketing Cloud for AppExchange User. Next, the CRM admin creates the Salesforce System User. This record is what connects Marketing Cloud to the CRM environment. For optimal security and performance, we recommend you set aside a dedicated user license in your CRM environment for this purpose. Under Administer in the Setup menu, click to expand Manage Users. Under Additional Information, select the Marketing Cloud for AppExchange Admin and Marketing Cloud for Appexchange User checkboxes. Ensure “Generate new password and notify user immediately” is selected. Salesforce emails the address you specified. The Salesforce CRM admin then follows the instructions in that email to verify the identity of the new user record and specify the password for this new user account. For the two systems to communicate properly, we next need to create a generic permission set in Salesforce CRM and update the Marketing Cloud connected app settings. This is necessary to grant access to users connecting to Salesforce CRM from Marketing Cloud. In the CRM org, click Setup. Give the permission set a memorable label. For example, Marketing Cloud Connected App. Select the Salesforce System user account you created in the last section. All end users who plan to use Marketing Cloud Connect to send emails need this same permission set assigned to their user record in the Salesforce CRM org. Email Opt Out is a standard field on the Contact and Lead objects. For Marketing Cloud Connect to work properly, the CRM admin needs to ensure that all Marketing Cloud Connect users have view access to this field. Under Build in the Setup menu, click to expand Customize. In the list of standard fields, click Email Opt Out. Select the Visible checkbox for all user profiles that need access to Marketing Cloud Connect including the System Administrator profile. Add read-only restrictions based on your business requirements to any user profiles that should not be able to edit this value. For example, Partner Community User and Read Only User. Back on the Setup menu, under Build > Customize, click to expand Contacts. Select the Visible checkbox for all user profiles that need access to Marketing Cloud Connect, including the System Administrator profile. Add read-only restrictions based on your business requirements to any user profiles that should not be able to edit this value.